The E litter had their first training day at HQ yesterday. From left to right are Echo, Ernie, Eddie, Eyke and Errol. Its hard to believe that its 3 weeks since our E litter left us to go to their new puppy walker homes. 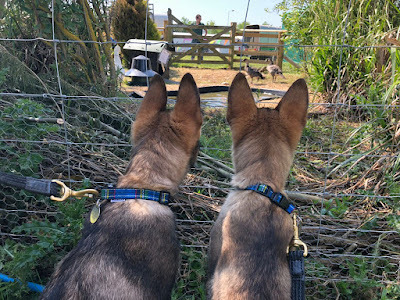 Once the pups had settled in to their new homes I visited all of the pups and puppy walkers to make sure they were coping and to give them advice on all the usual issues that crop up in the first few weeks. Here are some photos of my visits. Eyke is based in Exeter with puppy walkers Rob and Sue. 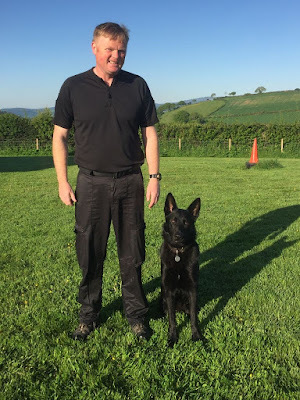 Eyke was his usual lively self and the first job was to show Rob how to stop him biting, nipping and how to get him to leave a toy or possession on command. When he eventually ran out of energy I left him asleep in his bed. Next was Echo who also lives in Exeter with her puppy walkers Paul and Michelle along with her new pals the Muppets, Bill, Weed and Ben. Echo has certainly made herself at home and is as playful as ever. 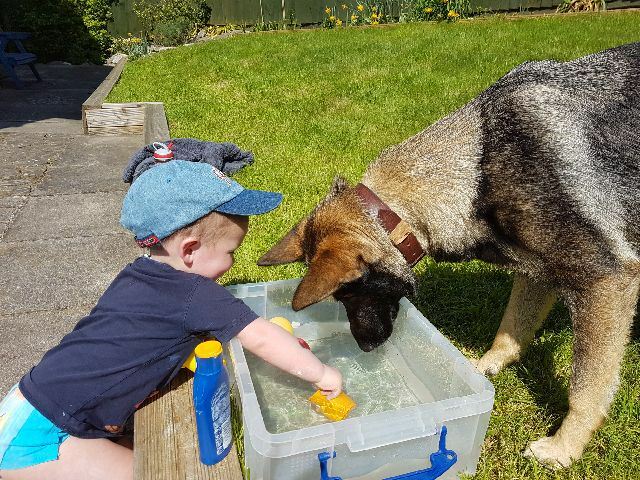 Eddie is pictured here with puppy walker Alaina and they are based in St Austell, Cornwall. On my arrival he had been in a deep sleep and didn’t realise who I was. Then Just like all of his siblings Eddie gave me a great welcome and then gave me an extended version of his determined play drive. Ernie is pictured here with puppy walker Joe and his daughter in Truro. Unfortunately although the family were enjoying having Ernie things didn’t quite work out and we have had to relocate him. 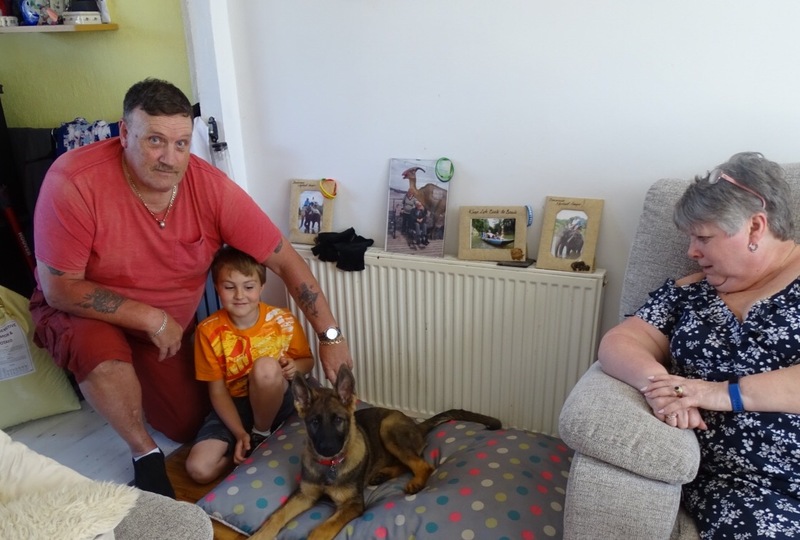 I would like to thank Joe and his family for trying their best for Ernie and making the long trip up to Westward Ho to take him to his new home. They made sure they also took his favourite friend and constant companion with him. He is now with new puppy walkers Wilma and Colin in Westward Ho. Although he has only been with them for a few days he enjoyed his first training day and when I visited them today he seemed totally relaxed and settled. Errol was completely relaxed at his new home and is still eating like every meal is his last meal. We had a good play session together and when I left he was showing no signs of slowing down. Elsie is pictured here with Sam from Plymouth. We sold Elsie to Sam and although she is no longer in the program Sam keeps in touch to let me know how she is getting on. We all met at HQ for our first training get together and considering they hadn’t seen each other for 3 weeks they were very well behaved. We started by introducing them to the low ramps and a shortened tunnel which is all part of the process of building their resilience. Here is Ernie making it look very easy. Once I had shown the puppy walkers how to take each pup over the ramps it was their turn to have a go. They were all very confident and enthusiastic negotiating the ramps and so we then introduced them to the tunnel. It can take some pups a little while to get them to build up the confidence to go through the tunnel but they all went straight through when they realised I had a liver titbit. All the puppy walkers then had a go with their pups. Eyke went through the tunnel and took his titbit but then decided to go back inside the tunnel to get out of the warm sun and was then in no hurry to come out again. We then introduced the sit and down again using titbits. 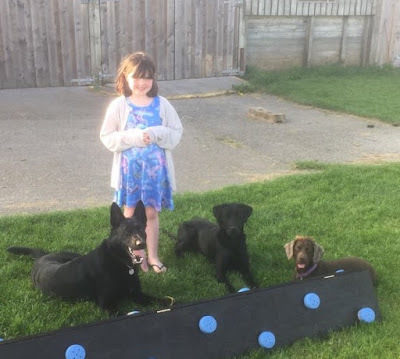 Next we practised recall’s with the pups on a line and again they all completed their recall’s with enthusiasm and just like their sit’s and down’s they remained focused and not distracted by the other pups. We then introduced them to the early stages of heelwork. I had planned an introduction to tracking but it was very hot and the pups were feeling the heat. 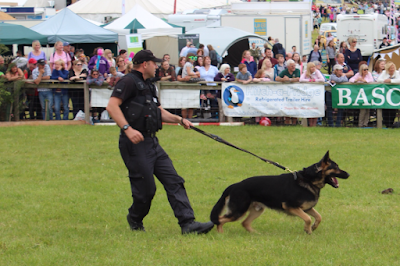 So after a very enjoyable session we dispersed and will be meeting up again on Saturday to appear at the Devon county show. Left to right are Peppe, Merlin, Quest, Quini and Henry. Peppe is pictured here with puppy walkers Lyndsay and Chris who have puppy walked him since he arrived from Holland aged 4 months. Peppe was a little unsure on arriving from Holland but Chris has worked hard on his training and environmental work which has resulted in a confident dog with excellent working potential. In April he was transferred to Graham Attwood who will be the course instructor for the Initial Police dog course in September. Over the next 3 months Peppe will be living with Graham and his family as he is prepared for the course. Peppe is pictured here with Graham’s dogs and his daughter Polly. Chris and Lyndsay have now taken on a new venture. Instead of puppy walking they are now caring for Elsa who we hope is going to be one of our 3 breeding females. She is having her hip and elbows x rayed this week and if they are very good she will live with Chris and Lyndsay long term as our breeding female. 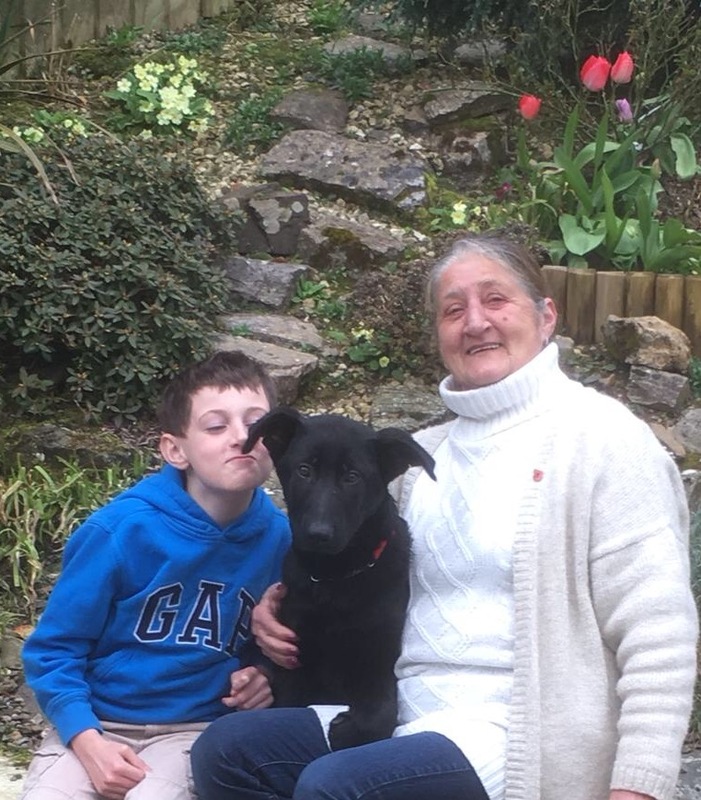 Henry is pictured here with his puppy walkers Jill and Terry. Henry is progressing well in terms of his working ability. His searching, tracking and bite work are very good. Environmentally he is not as confident as I would like him to be. He is uncomfortable in new situations and has been a bit like that since we acquired him. The next few months for Henry are going to be crucial in terms of whether he remains in the program. Unless a puppy is very confident environmentally and is clear headed in character then training and developing him to be aggressive in certain situations is not a good idea. 9 Month old Merlin is pictured here on our last training day with puppy walkers Lyn and John. Merlin is environmentally very confident and has an extremely high work drive. He takes everything in his stride. Here he is on our last training day being introduced to the first stages of person searching by barking at the criminal for his toy. 10 Month old Quest was imported from Belgium aged 15 weeks with his sister Quini and is pictured here with puppy walkers Colin and Mitzi. Quest is a very confident, powerful and highly driven dog who is thriving in all aspects of his training. Here is a short video of Quest with Mitzi in the early stages of criminal work. Quini is the sister of Quest and has now been allocated to PC Chris Carter a dog handler in North Devon. 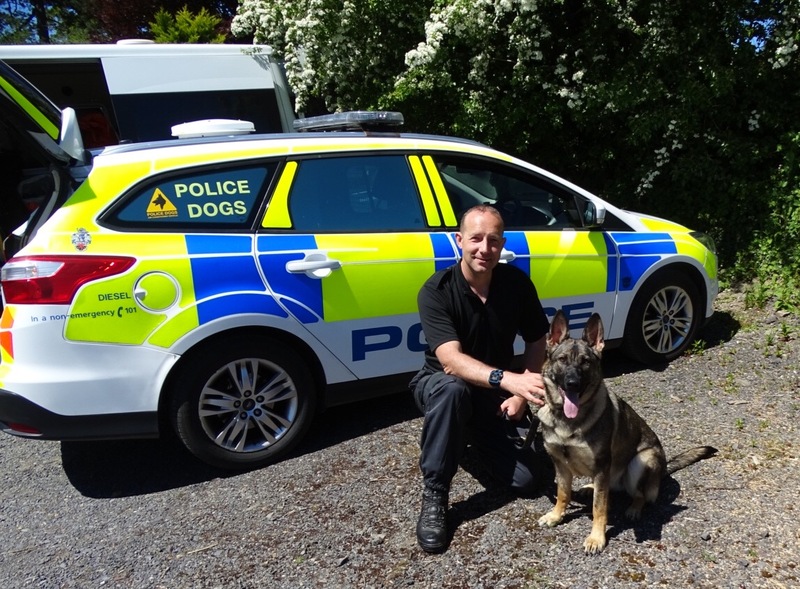 Chris currently works Police dog Maverick and drugs dog Rosie. 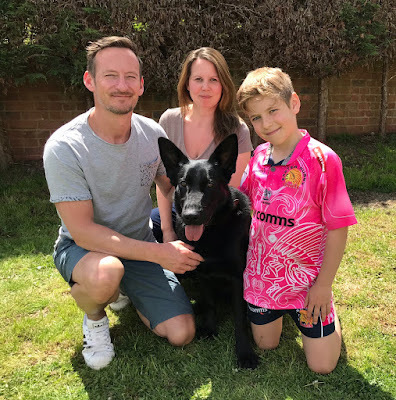 After a very successful career Police dog Maverick has now retired and will continue to live at home with Chris and his family to enjoy retirement. Maverick has a very strong personality and there would probably have been issues had we allocated Chris a new male Police dog replacement. It is for this reason we have allocated Quini to Chris because having a female replacement will negate any potential future problems. Gunnar has been puppy walked by Mark, Hannah and Isabel. Together they have done an excellent job training and developing him and also nursing him through a period of sickness. Unfortunately now that he has hit 12 months he has become a little rebellious particularly with regard to Hannah and daughter Isabel. This came to a head when he growled at Isabel and Hannah over removing his empty food bowl from his cage. As a result I have withdrawn him from the home and he is now living with me for evaluation. My experience of observing hundreds of pups developing into adults has led me to believe that food aggression and possession aggression is mainly genetic but that it can be controlled, managed or made worse if not addressed correctly. I will be doing an individual blog on how to deal and manage with this behaviour because it something that crops up on a regular basis. 15 month old Eva has been puppy walked by Lisa and Martin since I imported her with her sister Ella from Germany when they were aged 15 weeks. Lisa has been very ably assisted by her son Billy and they have between them developed and trained her to an excellent standard. Tragically we received the devastating news that she suffers from Pancreatic enzyme deficiency. Although with her daily medication she will lead a normal life she cannot now be a Police dog because stressful situations could trigger and complicate her condition. Unfortunately Lisa, Martin and Billy cannot keep her but we have found her a lovely home with Krystal, Ian and their young son Leo. 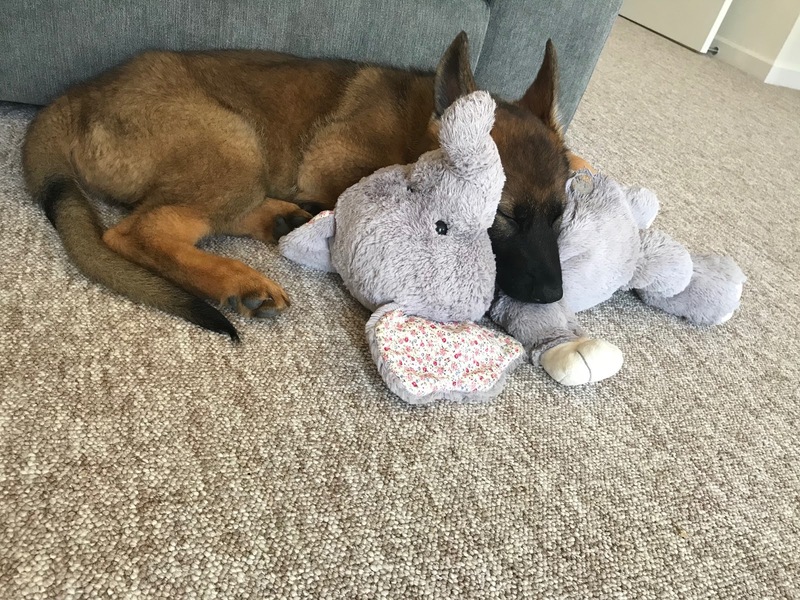 Eva has settled in well and has a new friend in Leo. From left to right are Bill, Lola, Star, Larry, Sydney and Ben. Bill is now coming up to 6 months of age and is being puppy walked by Chris Highton. He is a very driven determined dog who is a real handful. Fortunately Chris is experienced and realises that he needs to strike the right balance between allowing him to flourish but still ensuring control is maintained. 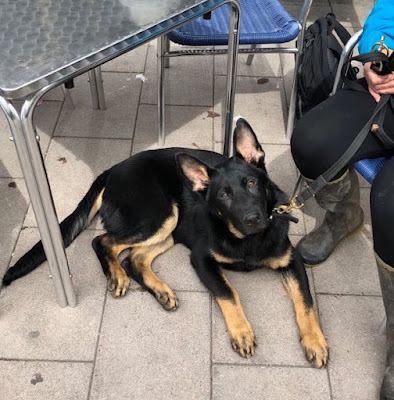 Lola is now 5 months old and is being puppy walked by Karol and his family in Plymouth. Lola is a very driven and outgoing Malinois/Dutch herder female who loves life and is progressing really well. We also started with her litter sister Lulu but due to her not having particularly strong nerves I had to return her to her breeder who will replace her at a future date. 5 month old Star is one of 3 pups we imported from Holland last month. He is a very sweet natured dog who is being puppy walked by Margaret in Plymouth. Like most of the imported pups he has not had that vital socialisation between 8 and 14 weeks. Margaret is getting him out and about making up for lost time and he is improving day by day. He is still nervous of people particularly men coming too close and at the time of writing this blog I am concerned about this. 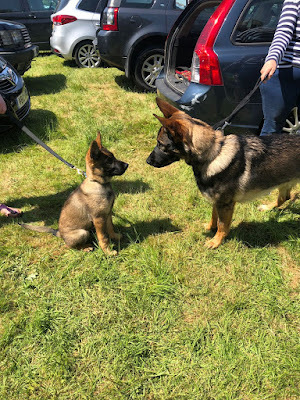 We will continue his intense socialisation and we will improve his confidence but whether it will be enough for him to be a Police dog Im not so sure. Larry is another one of the 3 pups imported from Holland aged 5 months. I purchased him as my own dog but he will be a reserve should any of the other pups not be successful. I am very grateful to Angie and Graham Collins who have been looking after Larry for me until I finish evaluating Gunnar. Sydney is the third of the group of 3 pups imported from Holland. Sydney is 5 months old and is the litter brother of Star. He is being puppy walked by 1st time puppy walker Phil Ash. He is a very happy outgoing energetic pup who is developing very well and has excellent potential. Ben is the litter brother of Bill and is being puppy walked by Lyn and Dave Vooght who are also first time puppy walkers. Ben like his brother is a very energetic and playful pup who is progressing well both environmentally and in his work exercises. 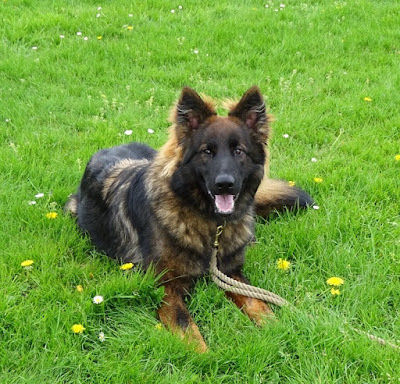 Unfortunately Lyn has some health issues which mean that we are looking for a new puppy walker for Ben. Lyn and Dave have kindly agreed to continue to look after Ben until a suitable puppy walker can be identified. My next blog will cover the Devon County show and will include an update on our 3 potential breeding females Sasha, Elsa and Ella. Our older pups will be appearing in support of the Police dog display on Thursday. Our Jan 2019 pups will be appearing on Friday and the E litter will be appearing on Saturday. Hope to see you at the show. From myself, Ella and Gunnar bye for now.